1953-1957 General Motors used this style rear view mirror on all its Chevy cars, the 2 dr Sedans, 4 dr Sedans and wagons. 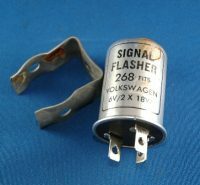 It possibly was used on Pontiac and Oldsmobile of those years. And this style mirror for these years is only being made with the chrome back. 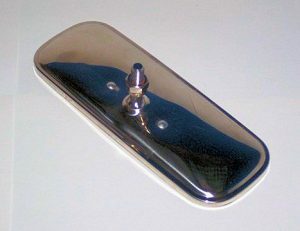 What I am offering here for sale is a new reproduction chrome back rear view mirror. It is new and beautiful and you will be happy with this item. For information these reproduction mirrors are made with the chrome back. GM used this chrome back mirrors only on the Convertible and the Sport Coupe , commonly called the Hardtop. The mirror used one the sedans and wagon had a painted back but in every other way is the same. Same size, same shape. The painted back mirrors had a painted back and painted mounting shaft and are not being made today. Also just for your information. The primary difference between this mirror, used on the 1953-57 and the 1949-1952 mirror is the length of the threaded mount. On the 1949-1952 the threaded mount is 1 inch longer and has a slight bend formed into it. That correct 1949-52 mirror in this form is not being made today but the accessory “Day Night” mirror, correct for the 1949-52 is being made today and I offer it elsewhere on this page. “Day Night” mirrors have a small flipper, usually on the bottom of the mirror and it is there to tilt the glass portion of the mirror slightly and stop the driver from being blinded by the high beams of a following car. One other thing. the 49-52 mirror mounts on the windshield divider about 1/2 way up the windshield divider while the 1953-57 mirrors mount at the top by the roof and only the 1953-54 Sport Coup has the mirror mounted on the dash.